A collection of five short stories which all have one thing in common: no frills. These tales cut right to heart of the matter they don’t meander along with unnecessary flowery language or page filling meaningless unwanted description. This collection bypasses the pleasantries and goes straight for the jugular. How refreshing! The endings when they come are usually sharp, stark and a shock to the system. McDroll’s stripped back style is interesting and unique. If asked to pick a favourite it would have to be Drowning. McDroll conveys the internal dialogue of a desperate woman excellently and ends the story with a flourish of brilliance. Three of the five stories deal with character DC Gemma Dixon. A wise cracking young woman working hard to survive and thrive in the man’s world that is modern policing. 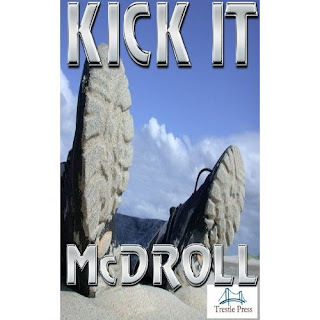 McDroll’s collection of stories is set in Scotland and her use of language reflects that giving extra realism to the stories. A great value collection that is well worth downloading. I understand they're thinking of putting up a fence around Fio -- er -- I mean McD -- and declaring her a National Treasure. I agree.